Once the garden grows bigger and we have a glut of cherry tomatoes, I plan to make this dish again for a harvest-type dinner with the roomies. This will mean two pans since Roomie #1 is a vegetarian. Usually that would mean that I would use mushrooms as a substitute and we would all have the same dish but, for whatever reason (I think it is the texture), she doesn’t eat those either. Two pans it is. One with meat sausages and one with faux-meat sausages. This way, we have plenty! 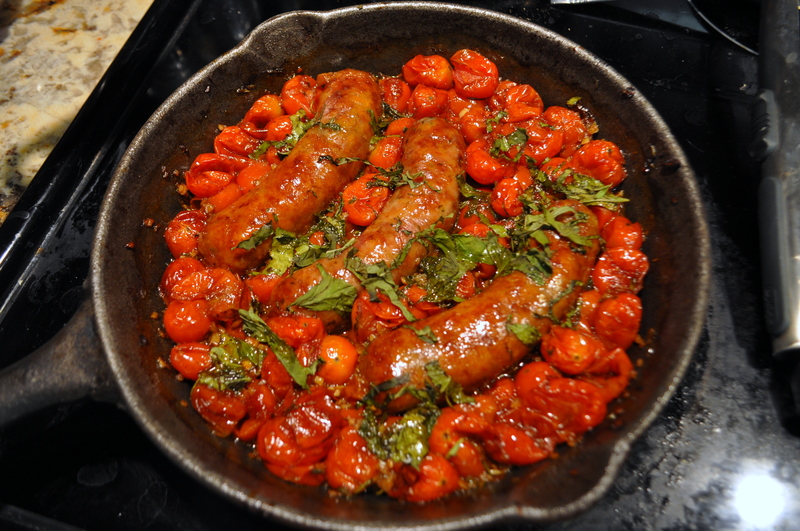 This recipe is easy, and, if you use the right kind of sausages, quite healthy. All you do is toss all the ingredients together and roast until the tomatoes are cooked to you liking. Nothing easier than that! I like to serve it over creamy polenta but pasta or even mashed potatoes would be yummy as well. As with many of my recipes, simply change up the spices and you can have a totally new dish. Try chicken sausages and sage or thyme. Maybe chorizo and cumin…or do the Hawaii version with Portuguese sausage! All are good options. Just look for the best sausages at your grocery store and go from there. You never know just what you will end up with until you put it together anyway, right? Tomatoes, garlic, and herbs – yum! I have some rapidly withering cherry tomatoes, so I shall be trying this tonight!